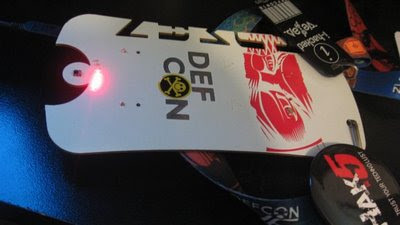 I know, you're sick of hearing about the DefCon Badge, most likely. I couldn't get it working on my Parallels Win2K Virtual Machine. I decided to clean up the solder joints a bit to see if that helped. 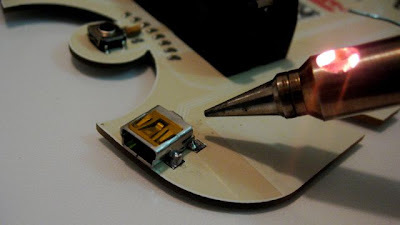 Yes, I usually prefer my butane soldering iron when working on electronics. That didn't help, unfortunately. I decided to take over my wife's older workstation still running Win2K. Driver detected off the CD (just like it did under Parallels) and so I fired up Hyper Terminal... Success! Seending TV-B-Gone power off codes. Power off code list complete. Repeating! 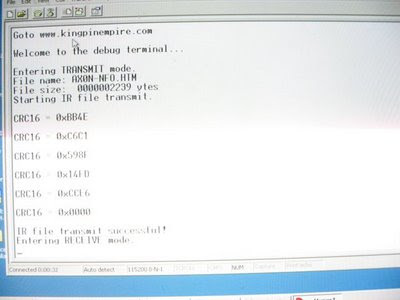 So you can see it transmitting the file and working as a TV-B-Gone from the serial console, all from the USB connection. Nice! For anyone who's interested, this is the file my badge transmits. I'll bring it along to CCCKC tomorrow so we can all play with them, if anyone else brings theirs along. I am having trouble downloading the freescale software, but I do intend on tinkering with the firmware on the badge as soon as I figure out what I'm doing.